The Su-27PU (later known as Su-30) was developed in the late 1980s as a long range interceptor and airborne command post for the Soviet Air Defense Forces. The two-seat Su-27UB combat trainer was selected as a basis for this variant because it had the performance of a single-seat Su-27 and the benefits of having a two-men crew. To adapt the Su-27UB to its new role the aircraft was fitted with an in-flight refuelling system to increase range and the aircraft's avionics were changed, fitting special communications and guidance equipment to command formation flights of single-seat Su-27 interceptors. The rear cockpit received a large CRT display which provides the formation leader with tactical information regarding targets and interceptors. The navigation and fly-by-wire systems were also upgraded. Since series production of the Su-30 started in 1991, the first aircraft being test flown on 14 April 1992, only a handful have entered service with the Russian Air Force. 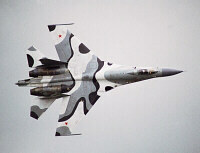 In 1993 Sukhoi converted the first series produced Su-30 into a demonstrator to market the multi-role version designated Su-30MK. MK standing for Modernizirovannyi Kommercheskiy ('modified commercial') indicating that this new version was developed especially for the export market. Centerpoint of the new version would be an upgraded multirole fire control system, depending on the customer's requirements. The air-to-ground capability of the aircraft is effectively greatly enhanced and a large variety of new guided missiles and bombs were added to the armament options. For the air-to-air role, the new RVV-AE (R-77) medium-range active radar homing missile was added to the options. The first customer for the multi-role Su-30MK was India. To meet the customer's demands the Su-30MKI variant was developed. The Su-30MKI differs substantially from the original Su-30MK demonstrator. The new variant is fitted with canards and new thrust vector controlled (TVC) engines to boast the aircraft's manoeuvrability. The nozzles of the AL-31FP engines are able to vector up to 15 degrees in both vertical and lateral direction. The Su-30MKI is fitted with the NIIP N011M multimode phased array radar, which is also the radar of the Su-35/37 advanced single-seaters. The IRST system was replaced with an updated version - OLS-30. The head-up display and navigation systems were replaced with systems from the French manufacturer Sextant Avionique. The first prototype Su-30MKI (Su-30I-1) was first flown on 1 July 1997, the second prototype on 23 April 1998. Both of these were converted from series produced Su-30s. The first batch of Su-30s for the Indian Air Force was however delivered in the spring of 1997. These were of the Su-30K type ('commercial' version of the basic Su-30), sometimes also designated Su-30MK since some limited upgrade work had been done. The Su-30K/MK fleet will be replaced by new Su-30MKI aircraft, with Russia buying back the Su-30Ks. India's orders for the Su-30MKI count 32 aircraft produced by Irkut, 140 license-built by HAL, 18 Irkut produced Su-30MKIs as Su-30K replacements, and an additional batch of 40 license-built aircraft is being considered. As of mid-2007, at least 50 Su-30MKIs including the first 32 produced by Irkut, are believed to have entered service. The Su-30MKK multi-role twin-seat fighter was developed for China. Like the Su-30MKI it gas a twin-seat cockpit with modern multifuction displays and is equipped with an in-flight refuelling system. In addition to these updates, the aircraft is also fitted with the larger fins of the Su-35 design to accomodate more fuel. However it does not have the canards and TVC engines for super manoeuvrability. The aircraft carries the N001VE radar which is compatible with the RVV-AE missile. Like other Su-30MK derivatives it carries a wide arrange of air-to-air and air-to-surface weapons on 12 hardpoints. The take-off weight however has been increased to 38,000 kg by airframe and landing gear stengthening. 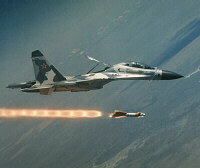 This makes the Su-30MKK the only Su-27 derivative which is capable of both maximum payload and maximum fuel carriage. 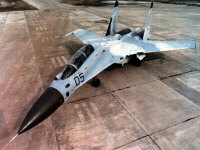 In 1999 Sukhoi converted the T10PU-5 (first Su-30 prototype) into the first Su-30MKK, first flying on 9 May 1999. It was quickly followed on 19 May 1999 by the first production Su-30MKK '501' built by KnAAPO made its maiden flight. In the summer of 1999 another production Su-30MKK was roled out, this aircraft carrying serial '502' was painted in similar colors as the Chinese Su-27SK/UBK fleet. Series production has begun of about 50 aircraft destined for the PLAAF. Follow up orders consist of the updated Su-30MK2 and Su-30MK3 specification (alternative designations are Su-30MKK2 and Su-30MKK3 respectively). The multi-role two-seat Su-30MK variant are attractive candidates for many countries that are in the market for a fourth generation fighter. Indonesia followed India and China by obtaining two Su-30MKK variants. No official designation has been appointed to this variant. They are believed to be equivalent to the PLAAF Su-30MKK variant, generally referred to as just Su-30MK or Su-30MK(I). In the past, Indonesia cancelled a contract for single-seat Su-30s (see below) because of monetary issues. The selection of the Su-30MK seems more to be an issue of having a modern combat-capable trainer, than to have a multi-role two-seater, since Indonesia also obtained two single-seat Su-27SK in the same deal. In 2007, Indonesia placed a follow-up order of 6 aircraft to establish a full Flanker squadron, with the order consisting of three Su-27SKM single-seater fighters and three Su-30MK2 two-seater strike fighters. The latter were delivered in January 2009, with the single-seaters following in September 2010. Reportedly the Indonesian government plans to acquire more Flankers in the near future. Vietnam also placed on order for a slightly modified version of the Su-30MK2, reportedly designated Su-30MK2V and featuring upgraded communications suite and improved ejection seats. The four two-seat aircraft were delivered in November 2004. In January 2009, another contract was signed for eight Su-30MK2V, with all to be delivered in 2011. Malaysia signed a contract for 18 Su-30MKM fighters in 2003. The Su-30MKM is another multi-role Flanker variant based on the Su-30MKI, tailored to the customer's requirements with regards to its avionics suite. For example, Israeli-produced ECM systems as seen fitted on the Su-30MKI are replaced by Russian and South African systems. Two of Sukhoi's Su-30MKI pre-production aircraft (bort numbers 04 and 05) served as Su-30MKM prototypes. The Su-30MKMs are being manufactured at the Irkutsk Plant and the first two aircraft were formally handed over to the RMAF in April 2007 at Irkutsk, before arriving in Malaysia on June 18, 2007. Deliveries were completed in 2008. The Su-30MKM proposal was pitted against the Boeing F/A-18 Super Hornet. Malaysia opted to order the Su-30MKM. Malaysia currently operates a mixed fighter fleet, with both the Russian Su-30MKM MiG-29N Fulcrum and F/A-18D Hornet. RMAF officials were quick to counter early reports that the new Su-30MKM aircraft would replace the Fulcrums, saying that the MiG-29s will remain in service as a pure air defense fighter. By 2011, it was announced a replacement would be acquired. Additional Su-30MKMs may be ordered, but currently the Su-35 is available, although it seems more likely that a Western type will be selected this time. In 2005, Thailand formally requested information for the possible acquisition of the Su-30MK/MK2 However, the Saab Gripen was procured instead. In 2006, Venezuela ordered 24 Su-30MK2 AMV (also known as Su-30MKV) multi-role Flankers with the first deliveries taking place in late 2006. The Su-30MKV is largely based on the Su-30MK2, produced by KnAAPO. KnAAPO started development of an upgrade programme for the single-seat Su-27SK in 1995, then designated Su-27SMK. The upgrade would improve range and combat effectiveness by making it multi-role. The first phase of this upgrade resulted in the Su-30KI single-seat tactical fighter in 1998. Based on the Su-27SK, it was fitted with IFR probe, satnav receiver, ILS/VOR navigation and landing systems, RVV-AE missile capability. The next phase implements new advanced avionics, computers, phased array and weapons. The Su-30KI (No 40-02) prototype being converted from the Su-27SMK demonstrator, first flew on 28 June 1998. The aircraft is painted in a grey-black-blue paintjob and first was revealed at the MAKS '99 international aerospace show. Earler in 1997 Indonesia placed an order for 24 Su-30KI fighters, believed to be the same standard as the 'Su-30KI upgrade' although some sources say it was specifically developed for Indonesia. The order was cancelled and the Su-30 seems now to be reserved for the combat two-seaters. The Irkutsk Aircraft Industrial Association (IAIA - Irkut), jointly with Sukhoi Design Bureau, "Russkaya Avionika" Design Bureau and Russia's Air Force developed an upgrade for operational two-seat fighters, the Su-27UB, Su-30 and Su-30K. The Su-30K prototype was upgraded to Su-30KN standard. The first phase of the upgrade enables the aircraft to operate guided ASM and bombs by adding a new mission computer, upgrading the N001 radar and weapons control system. The cockpit has been equipped with colour MFDs. It also adds to the RVV-AE (R-77) missile to its inventory. This first phase can be followed up by a second stage upgrade which enhances the air-to-air capabilities by replacing the slotted antenna with a phased-array antenna. Other suggested improvements include modern avionics and bigger MFDs. AFM (2002-2008). various reports, Air Forces Monthly, Key Publishing Ltd, UK. AFM (2007). Indian Su-30K for Su-30MKI Swap, Air Forces Monthly #231, June 2007, p. 23, Key Publishing Ltd, UK. AFM (2007). News Briefs, Air Forces Monthly #231, June 2007, p. 19, Key Publishing Ltd, UK. AFM (2007). Malaysia's First Two Su-30MKMs Handed Over, Air Forces Monthly #232, July 2007, p. 32, Key Publishing Ltd, UK. AFM (2008). Algeria's First Two Su-30MKAs Arrive, Air Forces Monthly #239, February 2008, pp. 22, Key Publishing Ltd, UK. AFM (2008). Sukhoi Su-30s Presented to Malaysian Government, Air Forces Monthly #239, February 2008, p. 26, Key Publishing Ltd, UK. AFM, 2009. Indonesia Finalises Sukhoi Deal, Air Forces Monthly #251, February 2009, p. 24, Key Publishing Ltd, UK. AFM, 2009. Indonesian Su-30MK2s Delivered, Air Forces Monthly #252, March 2009, p. 27, Key Publishing Ltd, UK. AFM, 2009. 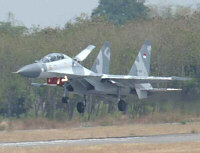 Latest Indonesian Su-30MK2 Now Active, Air Forces Monthly #253, April 2009, p. 5, Key Publishing Ltd, UK. Fomin, Andrei (2000). Su-27 Flanker Story, RA Intervestnik, Moscow, Russia. Fomin, Andrei (2007). Indonesia Planning More Russian Purchases, Air Forces Monthly #236, November, p. 21, Key Publishing Ltd, UK.